Have you ever heard the phrase, “When life gives you lemons, make lemonade?” In our case, the lemons came when my beloved Aunt Mary passed just before her 90th birthday. Our lemonade was planning a sweet mini vacation around her memorial service, which was halfway across the country. Our plan was to fly in early and spend a few days doing touristy things. One day in Santa Fe to begin with, then we'd head to Albuquerque, and finally we'd see the Taos area before heading back to Santa Fe for the service. I lived in New Mexico years ago before we were married, but I had never done the touristy things. We were going to fix that oversight on this trip. We would freeze our buns off. New Mexico has all the sun and blue sky you could want, but its capital sits at an elevation of 7200 feet above sea level. Santa Fe can get blistering hot in the summer and bitterly cold in the winter at that altitude — and we would be there in January. That's the bad part. The good part is that once you're properly dressed, you can move beyond all that mundane stuff and really appreciate where you are. As we landed, I realized that I had forgotten how gorgeous New Mexico is. It really is the Land of Enchantment. Nowhere else on earth will you find this special blend of Native American-Spanish-Mexican-Anglo culture. You can see it in its wood pole-and-adobe buildings, hear it in Native American chants, and taste it in the fiery red and green New Mexican chile sauces. New Mexico fires up all your senses. That said, even in this enchanting state, Santa Fe deserves its moniker “the City Different.” It's the country's oldest state capital for one thing. For another, it is an intriguing, laid-back city where world class artists live side-by-side with New Age millennials and Mexican-Americans share the streets with Native Americans. Okay, I'll confess that it was hard to create a one day itinerary because there are so many things that you can do in and around Santa Fe. Ultimately, I think we managed to fit in some of the best attractions Santa Fe had to offer, but everyone has different priorities. Please share your thoughts and travel tips in the comments section below, so we can all benefit. We planned our itinerary to begin at Santa Fe Plaza, a national historic landmark. This public square is easily the heart of the historic district and all the old streets fan out from there. Translated into tourist-speak, that means that many of the top things to see in Santa Fe are within walking distance. 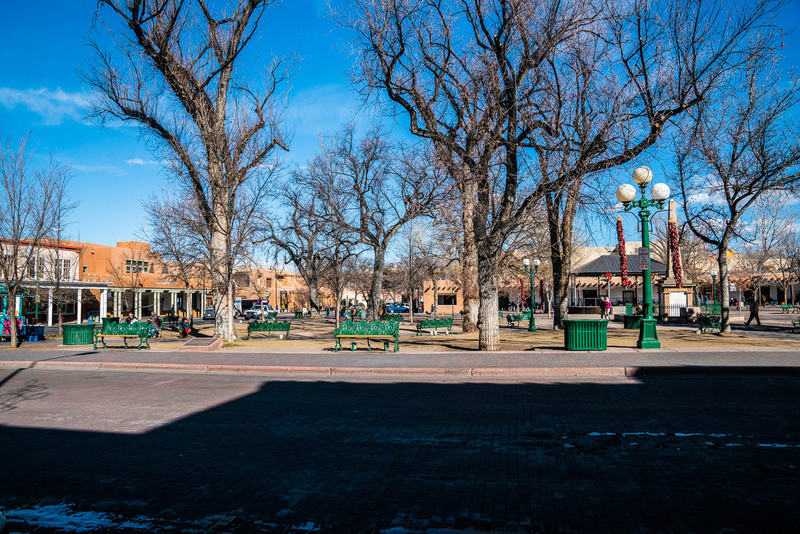 Santa Fe is over 400 years old and, like other Spanish-American colonial cities, its main plaza was once the city’s gathering point. I could almost picture the first Spanish settlers arriving in 1610, or see horse-drawn buggies pulling up to load supplies for the Santa Fe Trail. These days cars have replaced horses and Santa Fe Plaza sports trees, a bandstand, and an American Indian War Memorial. However, it remains a popular local hangout. Even on a frigid morning like this one, people were sitting on the park benches. I admire their fortitude. Tip: The plaza has limited on-street parking. Your best bet is to park your car in a garage or public lot and walk from there. We parked at a lot on Water Street. 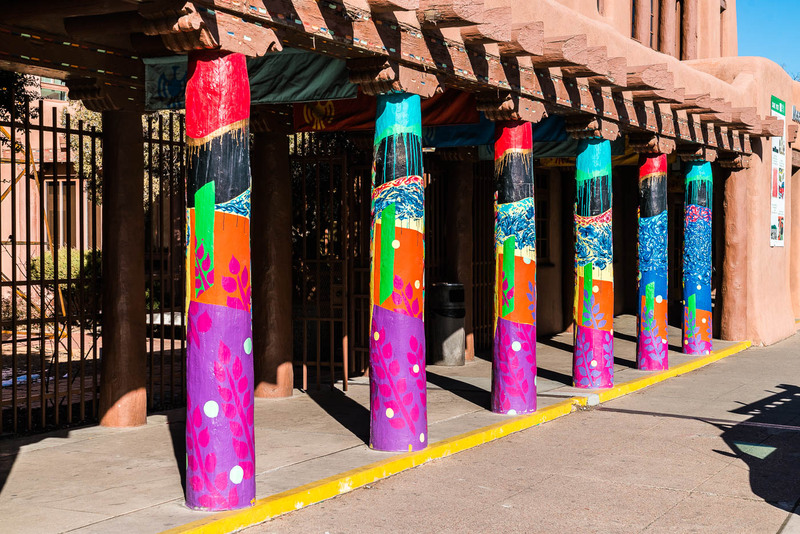 Santa Fe Plaza is surrounded by galleries, museums, shops, and restaurants, as well as a branch of the Santa Fe Visitor’s Center. (You’ll find it in Plaza Galeria.) We began our day there, so we could ask for a map of the historic district. On the advice of the bureau, we sprang for a couple of Margarita Trail Passports ($3 each) even though we rarely drink hard liquor anymore. In our rule book, exceptions are permitted when traveling, as long as they don't go against basic principles. In this case, it’s a popular attraction in Santa Fe. Besides, the weather is below freezing, and alcohol acts as an antifreeze, lol. So, why not? Apparently, Santa Fe was the first city in the new world to import tequila from Mexico. Then Maria’s New Mexican Kitchen created a collection of over 200 margaritas, all made with different premium 100% agave tequilas. Other Santa Fe restaurants noticed their success and started doing the same. As time went on, more and more restaurants added a selection of margaritas to their cocktail lists. Today, it’s hard to find a restaurant or bar that does not have at least one margarita on their drink menu. So naturally, Santa Fe decided to capitalize on it with the Santa Fe Margarita Trail Passport. It has recipes for 31 of the most creative margaritas in the city, each served at a favorite Santa Fe watering hole. 5 stamps = a commemorative Margarita Trail t-shirt. 20 stamps = an autographed copy of The Great Margarita Book. Taste your way through all 31 stops on the Margarita Trail and earn a Margarita Bartender Kit. Back on the street and passports in hand, we crossed the Plaza and began our Santa Fe tour. Spanish officials built the Palace of the Governors in 1610 and it has been in nonstop use since then. That makes it America’s oldest public building in continuous use. 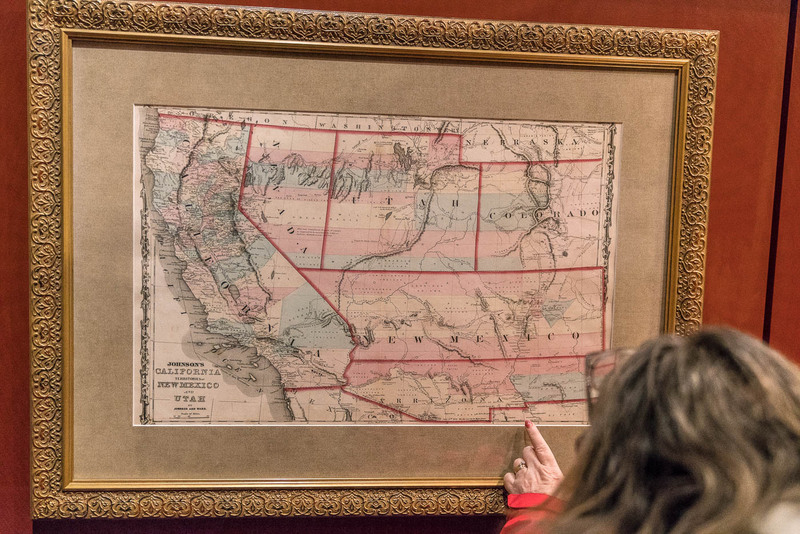 It was used as a government building for a few hundred years and they also had a display room for some of New Mexico’s best historical artifacts. After the state government moved to larger quarters, the building became the New Mexico History Museum. Unfortunately, with over 17,000 historical objects, there was never enough room to display everything. Solution: a huge, new addition, where you will find more than you need to know about the state’s past. We rarely take the time to explore museums when we only have a day in town, but we made an exception here. Kudos to the curators and designers for creating interactive exhibits that actually make state history interesting. Kudos too, to the many docents who are available to answer any questions you might have about Santa Fe’s Indian, Spanish, Mexican and American heritage. Oh – and we’re not shoppers, but the gift shop has some pretty unusual items. Verdict: Worth the price of admission, but it does deserve more time than the hour we gave it. Tip: If you enjoy fine art, head next door instead. The Museum of Fine Arts features more than 20,000 works of art from local and international artists, many that the Louvre might envy. The Palace of the Governors may have just as many interesting items on its verandah as within its walls. There, lined up on blankets under the overhang, Native Americans display their handmade crafts. It’s really worth taking a look. Santa Fe has long been known for its silver and turquoise, and the most exquisite workmanship is made by the First Peoples. Every piece here is authentic – the museum verifies every vendor’s tribal heritage, as well as authenticity and quality of work. So, you know you’re getting the real deal. We stopped to chat with an artist to compliment his work and ended up buying a few pieces to give as gifts. Considering that silver is not cheap, the prices were quite reasonable. Besides, we knew that we were buying directly from the artist who made it. It’s nice to be able to support a family business. Many vendors accept credit cards. We’d suggest browsing the entire length of the verandah before making a purchase – there is so much variety. Besides jewelry, some vendors offer blankets, pottery, rugs, and more. If you don’t see what you need there, another shop on the square, called the Santa Fe Indian Trading Company, offers a good variety of other Native American products. That shop was fun to look around, but our kids had asked for something a little more touristy and affordable: refrigerator magnets. We found a nice assortment of magnets, t-shirts, mugs, and so forth at the Original Trading Post, and as a bonus, the clerk was helpful but gave us our space. If shopping is your passion, you could easily spend most of your day just checking out what’s available on the plaza and on nearby streets. But if you want to make the most of your trip to Santa Fe, you might want to cut the shopping short and read on. Tip: Keep your eyes open for the little indoor mini-malls (mercados) tucked here and there between the Plaza’s storefronts. They are full of specialty shops. This is is the best place to go if you want something unique. One other building needs to be mentioned: La Fonda on the Plaza, which has been a Santa Fe landmark since it was built in 1922. With Its adobe-and-wood exterior and three-story bell tower, we can’t help but think its architect must have been inspired by Pueblo architecture. It just feels New Mexican. As one of the Historic Hotels of America, this luxury hotel is one of the best places to stay in Santa Fe (check prices here). But even if you can’t fit a stay into your budget, we highly recommend going inside to experience its elegant ambiance firsthand. The lobby is full of New Mexican heritage: exposed wood-beam ceilings, colorful tile floors, handmade chandeliers, Mission-style wooden furniture, and Native American blankets and pottery. Very cool. That said, it’s La Plazuela that made us love this place, a light-filled restaurant with trees and a central fountain that sits just off the hotel’s lobby. The menu made us wish we had skipped the hotel breakfast and come here instead. The menu features New Mexican dishes, both fusion and traditional, so if fajitas and tamales don’t appeal to you, there’s bound to be something that does. On a side note, La Plazuela is on the Margarita Trail. They serve a killer Centennial Margarita. It would be hard to miss the next stop on our itinerary: an imposing stone cathedral only a block from the square. 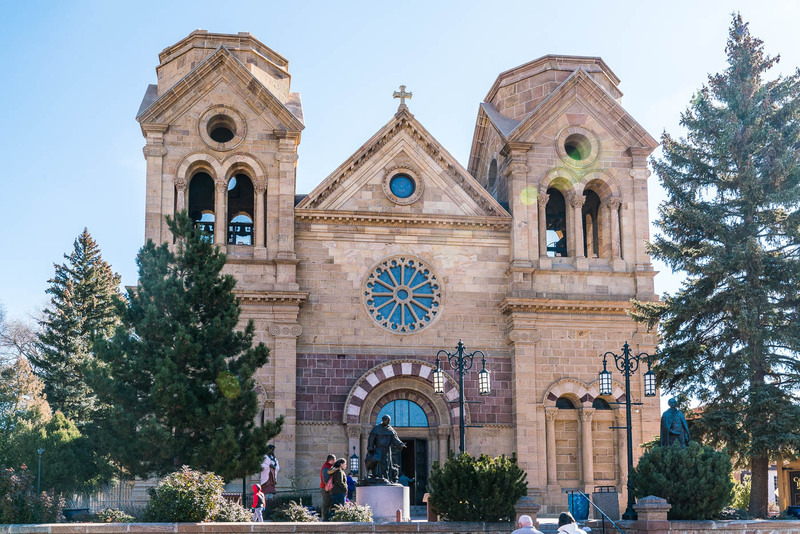 That is St. Francis Cathedral, another Santa Fe must-see that dates from the 1880s. New Mexico’s first bishop, Jean Baptiste Lamy, designed the cathedral to replace a small adobe church. The cathedral stands out from all the surrounding architecture because it was built with yellow limestone blocks rather than adobe. It rather figures: Archbishop Lamy was born in France and it shows in his design. Built in a style known as Romanesque Revival, the cathedral has round arches, Corinthian columns, and square towers, plus a large rose window in front that was imported from France. Come to think of it, that’s not too different from Notre Dame de Paris. I suppose if you can’t go to France, you might as well bring France to you…. Anyway, the cathedral contains precious relics from Santa Fe’s past as well as modern santero (religious) art. But the highlight is the chapel of La Conquistadora in the back. It contains the oldest statue of the Virgin Mary in the western hemisphere, along with the altar screen from the old parish church that once stood on this spot. Our next stop was only a couple of blocks away, a chapel built by the Sisters of Loretto. The nuns had come to Santa Fe at Bishop Lamy’s request in order to open a school for girls. 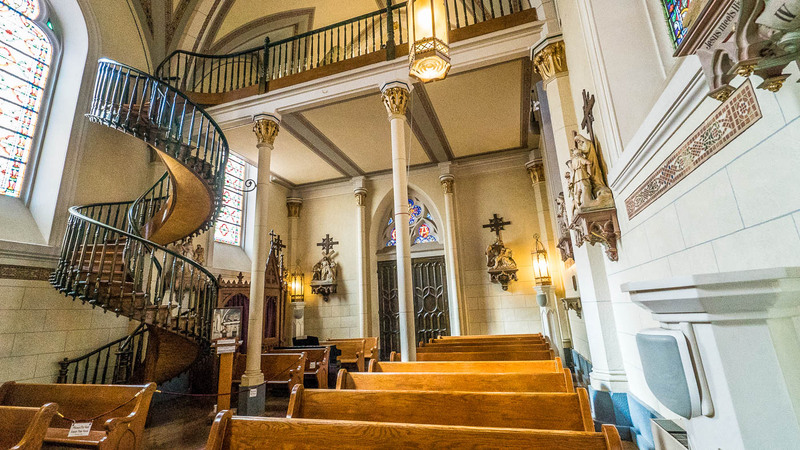 Like the cathedral, Loretto Chapel is French-inspired. It was modelled on St. Chapelle in Paris, complete with a soaring ceiling and a choir loft near ceiling height. Bad planning. They forgot one essential element: a way to get to the choir loft from the chapel! Every carpenter they consulted told them the same thing: either use a ladder or rebuild the balcony. The sisters refused to consider either option, claiming a conventional staircase would take up too much room in the chapel below. Being the good Roman Catholics that they were, they decided to ask their patron saint, Joseph the Carpenter, for a solution. And here begins Santa Fe’s most enduring mystery. According to legend, on the ninth and final day of their novena, a mysterious carpenter arrived on a donkey. He offered to solve their problem and design a staircase that would reach the choir loft. Using only the simplest of tools – a saw, hammer, carpenter’s square, and tubs to soak the wood – he set to work. He created a perfect, spiral staircase with no support from either the center or its sides. When the carpenter had completed his task, he vanished – before requesting payment. To this day, no one knows who built it, what type of wood it is made from, or how the staircase remains standing. The Railyard District is just a 20-minute walk from Loretto Chapel, but the parking lot is even closer, so we drove. Santa Fe became a transport hub in 1880, when the first train pulled into the railyard. By the time its 100th anniversary rolled around, trains had stopped running and the area was in bad shape. It probably would have been easier to raze the old warehouses, but instead officials decided to turn the Railyard District into an attraction they could be proud of. Today the area has been reborn. The imaginative designers created a park that integrates old railway tracks and train wheels with native plants and trees. Those old warehouses have been revived and are now home to a cinema, upscale galleries, art spaces, offices, craft stores, restaurants, and a brewery. The Railyard is also home to a huge farmers’ market every Tuesday and Saturday morning (7am – 1pm). With so much going for it, we thought this would be the perfect place to enjoy a traditional New Mexican lunch, Christmas style. Tomasita’s did not disappoint, though we did have to wait for a seat because it’s a local favorite. But that was fine with us; a busy restaurant is a signal that it serves good food. Tip: Your server will ask if you want red or green chile sauce on your food. Do as the locals do and respond, “Christmas.” You’ll get both red and green on your dish, which will give you a chance to try both flavors at once. Worth it! 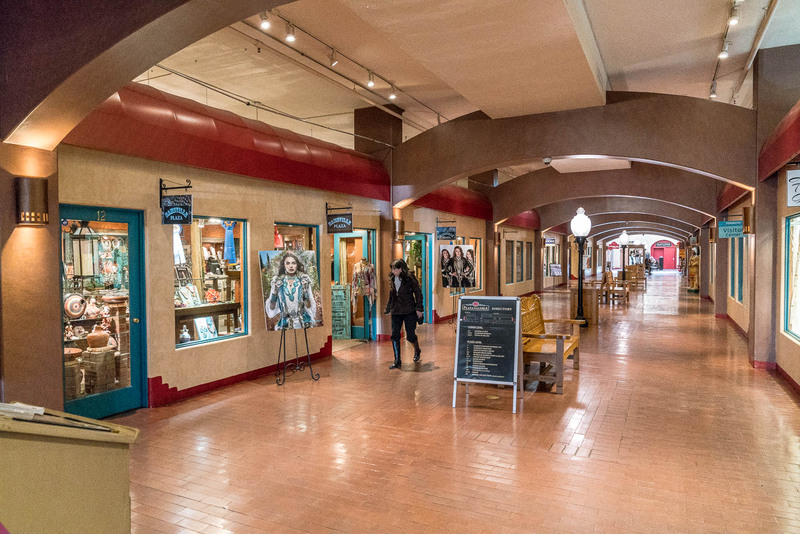 Santa Fe boasts hundreds of galleries, studios, and boutiques, and many of them can be found along Canyon Road. This mile-long stretch of road began as an ancient Pueblo Indian footpath, and it has morphed into a mecca for million-dollar shopping. We’d say easily rivals Rodeo Drive for Big Bucks Spending. We did a bit of window shopping on our way to our next destination, but we didn’t linger. Things might have been different if we had an extra day, though. Those Canyon Road galleries would have been fun to check out. We do know that you can find just about any art form you fancy – from painting to sculpture, to photography, to textiles and even rare Indian antiquities. If you have the money, it’s all for sale. Tip: The Teahouse is a favorite food and drink spot on Canyon Road. Be sure to try one of their many flavored and imported teas; it’s their specialty. Museum Hill ranks as one of the best places to visit in Santa Fe. It features four world-class museums as well as a botanical garden and a café. 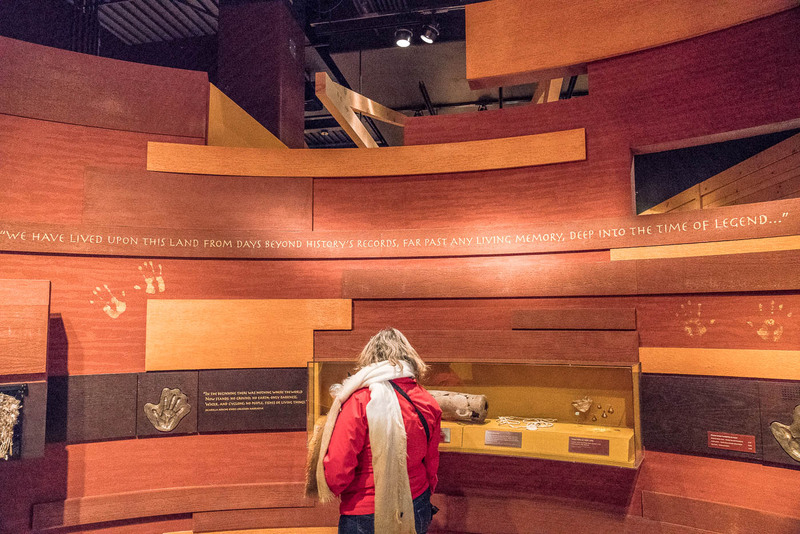 The museums there are dedicated to the art, history and culture of the Native American Southwest, the state’s Spanish colonial past, and folk traditions from around the world. Had it been warmer, we might have spent time in the botanical garden. Instead, we visited the Wheelwright Museum and the Museum of Indian Arts and Culture. Wheelwright Museum of the American Indian offers unique exhibitions of contemporary and historic Native American art and has the most comprehensive collection of Navajo and Pueblo jewelry in the world. The eight-sided museum building itself was inspired by a traditional Navajo hooghan. Museum of Indian Arts and Culture is home to more than 70,000 works of art and material culture. The outstanding collection displays ancestral and contemporary Southwestern Indian clothing, paintings, sculpture, pottery, jewelry, basketry, and weaving. Museum of International Folk Arthouses a choice collection of more than 100,000 toys, textiles, miniatures, and folk art from over 100 countries. Museum of Spanish Colonial Art features objects from throughout the Spanish Colonial world, housed in a historical building. It is the only museum in the U.S. dedicated to the art of the Spanish Colonial period including Hispanic New Mexico. 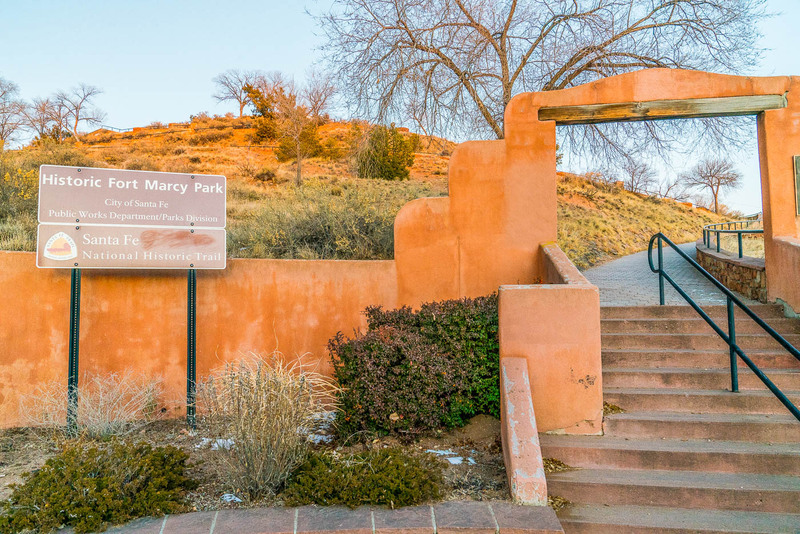 Santa Fe Botanical Garden at Museum Hill is an 11-acre, professionally landscaped area that features the wide variety of trees and plants that grow in the region. We timed our afternoon so that we could reach the Cross of the Martyrs in late afternoon. 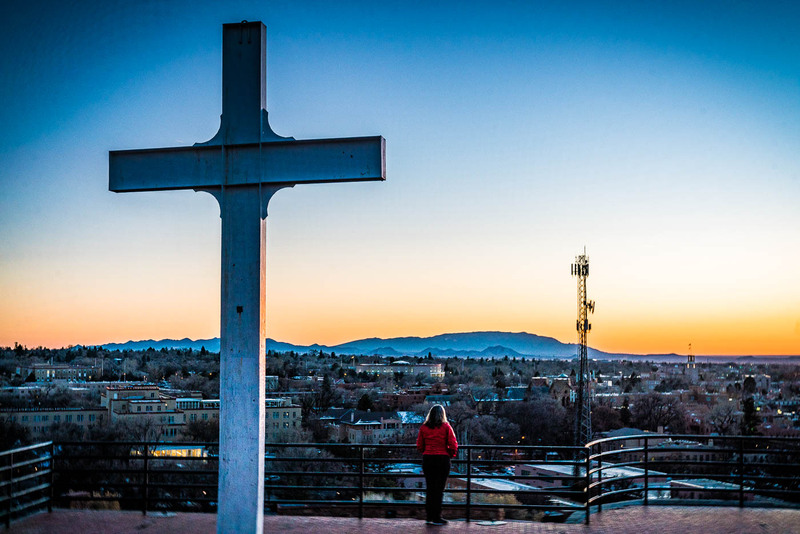 Hillside Park is one of the best places in the city to capture one of New Mexico’s many spectacular sunsets. Besides, it also offers one of the best views over Santa Fe – all the way to the mountains at the edge of the valley. To get to the cross, you need to follow a brick path that winds up the hill. The hill itself is steep, but the path was designed with a series of handrails, switchbacks, and steps, so it’s not a difficult climb. On the way up, a series of plaques along the way give you a chance to stop and catch your breath. They lead you through the 400-year history of Santa Fe, beginning in 1610 when the Spanish began the City of Holy Faith (Santa Fe). Then they move through how they colonized the area and end with the modern-day State of New Mexico. You’ll also be rewarded with that spectacular view of Santa Fe and the Jemez Mountains to the west. Tip: The climb up to the top is not steep but take it slowly if you have breathing problems. Remember that Santa Fe’s elevation is more than 7,000 feet above sea level. Back to the Railyard for dinner, because a local had recommended eating at La Choza. Like its sister restaurant The Shed, it is a family-run restaurant that has won awards for its red and green chile. They are also proud of their guacamole, fish tacos, chile rellenos, queso and sopaipillas, so we began with an order of queso and two Roca Bonita margaritas (Roca Patron, Bauchant and sour mix). That tided us over until our food was served. For one thing, they offer two types of carne adovada, not just the usual pork variety. Dan happily ordered a chicken adovada Enchilada Plate, Christmas style. The blue corn tortillas came stacked between two layers of cheese, with a sprinkle of onions & covered with chile. It was accompanied by pinto beans, posole & a garnish of lettuce & tomato. I ordered the Chile Relleno Plate, Christmas: Two whole roasted green chiles stuffed with Monterey jack cheese, coated in house batter, fried to a golden brown, covered with chile and topped with sour cream. Mine was served with pinto beans, Spanish rice & a garnish of lettuce and tomato. Chile, Chili. Please don’t object to how I spell chile. It looks weird to me too, but that’s how they spell it here. The best way to decide what to do at night is on the city’s official tourism site. Click around to find out what’s going on in town for music, dance, theater, and festival lovers. Take a docent guided tour of the New Mexico Museum of Artand its outstanding collection of southwestern painting and sculpture. The Georgia O’Keeffe Museum is dedicated to the life and legacy of New Mexico’s most famous artist, who lived in Santa Fe the last 40 years of her life. You can’t look at her art without thinking of New Mexico. Take a cooking class and learn how to make your own southwestern-inspired dishes. Visit San Miguel Chapel, in Santa Fe’s oldest neighborhood, which claims to be the “Oldest Church in the United States.” It was for sure the first church built in Santa Fe. While you’re there, go to the back of the church and use the mallet to ring San Miguel’s bell. They say that all those who hear its beautiful peal will someday return to Santa Fe. The “Oldest House in the United States” is next door to San Miguel Chapel. We’re not sure about that, but it’s pretty old. Take a look at those low doorways and tiny rooms. That will give you an idea of what it must have been like to live here, during its earliest days. When we travel, we make it a point to focus eat local, and this means lots of New Mexican food and drink. We’re not talking Mexican here – New Mexican cuisine is like its culture: a fusion of Native American, Spanish and Mexican tastes and ingredients. Think green chile stew, blue corn enchiladas … and of course, red, green, or “Christmas?” It’s all good, though you might want to try a green chile cheeseburger while you’re in town. And of course, the Margarita Trail adds another dimension to Santa Fe’s dining scene. The Shed is a James Beard Award-winning restaurant that has been around for nigh on 70 years. It was once a burro shed, hence the name. You’ll find it in an atmospheric 1692 adobe home only half a block from the Plaza. They are especially known for their Red Chile, and their Roca Coin is on the Margarita Trail. Santa Fe Bar & Grill was Aunt Mary’s favorite, though I don’t think she knew their High Mesa Blood Orange Margarita is on the Margarita Trail. Dan and I ordered their marinated sirloin steaks with homemade tortillas as well as their (very New Mexican) medley of squash, corn, mushrooms and spices. High ratings. We searched the site we use ourselves, Booking.com, for the best Santa Fe hotels based on price, reviews, and personal experience. Here are our top recommendations. We've included our affiliate links because prices are the same. Where is your ideal Santa Fe itinerary spot? We’ve collected some of the most helpful advice for you here. If you know of a resource we’ve missed, comment below and we’ll add it. TOURISM Santa Fe is your best source for all the city has to offer. Download their free visitor guide here. A Culture Pass, which gains you admission to many New Mexico Museums and historic sites throughout the state. Wondering what to do in Santa Fe this weekend? Check the Santa Fe calendarfor the current list. Lodging: If you’re staying overnight, we recommend using HotelsCombined. They compile the best deals from all over the web (including Booking, Expedia, Agoda, etc.). Transportation: This website shows how to get anywhere by plane, train, bus, ferry, and car. Santa Fe Trail buses run 7 days a week and cost adults only $1 each way. 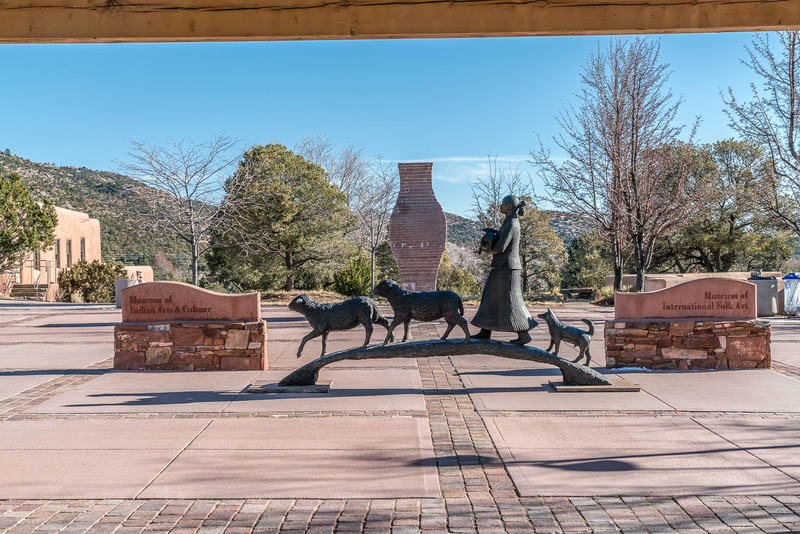 The most current information about routes and schedules can be found at the Santa Fe Trails Website or by calling (505) 955-2001. Want to find more things to do in Santa Fe? If you’re looking for things to do in Santa Fe, Viator offers dozens of affordable, custom Santa Fe activities and tours in Santa Fe. Click here to visit our Santa Fe tour page and get some great ideas of things to do. For more sightseeing, see our Santa Fe photo gallery. See Santa Fe from the air on Google Maps here. Zoom, scroll around, and explore! A town so beautiful as Santa Fe deserves more than a one day stay for me. As far as New Mexico goes, I’ve only been to Albuquerque on a cross-country train trip and even that city captivated me so I wouldn’t be surprised if I’d fall in love with Santa Fe! You’re right that Santa Fe deserves more than one day, Danial, and we don’t blame you for feeling as you do about Albuquerque. Santa Fe has the same unique New Mexican spirit, but a completely different personality. We’d like to hear which one fits you best.